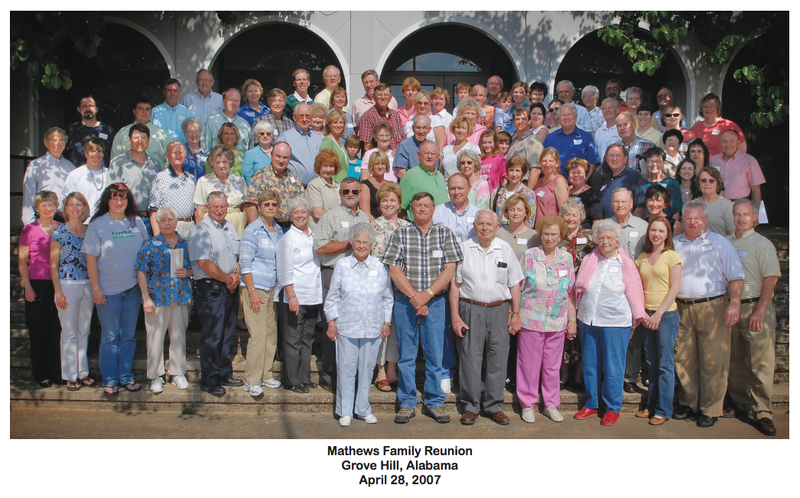 If you are a Mathews, related to a Mathews, or interested in the genealogy of this family whose roots are in Clarke County, Alabama, you may find this site of interest. We welcome your questions on family history, as well as any genealogical information you wish to share. You can email us at mathewsfamilyhistory [at] gmail.com. The McLeods became part of the Mathews genealogy when Frances Isabella McLeod married James Waldrum Mathews. She was the granddaughter of Neal McLeod who is discussed in Walter Davis’ article, “The McLeods of Clarke County: A Thousand Year Journey” that appeared in the Fall 2015 issue of the Clarke County Historical Society Quarterly. For a copy of this article, contact the Historical Society through their website: www.clarkemuseum.com. Or, if you’d like to share family history information, make comments, or ask questions publicly, please fee free to leave a note below in the comment section on this page. Hello!! I am James “Kevin” Mathews. I currently reside in Kentucky, but my grandparents were in northern Louisiana. My grandfather was Fred A. Mathews, Sr. My lineage on my father’s side, so far as I can tell, goes Joby D. Mathews (my father); Fred A. Mathews; George W. Mathews; William G. Mathews; Richard Lewis Mathews; Isaac (Jr.); Isaac (Sr.)… That’s where I am, so far, in my research. I am the 2nd daughter of Bernard wayne mathews & sharon lowe mathews from New Hampton, Ia. My fathers’ dads name is Christopher Wayne Mathews from Cresco, Ia. Or that area, he past away before I was born in 1967. I am interested in finding out more on my Mathews’ ancestors. I, too, am descended from Isaac and Mary Mathews through Moses Mathews and Sally Findlay and have been looking for proof of both Isaac and Mary’s parents. Please share any documentation found as I will gladly share if I have anything you might need. My Mathews’ settled in Oglethorpe County, GA and there are descendants still living on what (I believe) may be land left from the family’s Revolutionary Land Grant. I am a member of the DAR through Moses and would also like to use my Mathews line to join other lineage societies. I am Andrew Arthur Matthews from Cambridge UK and researching my paternal family line. I am researching Mary Mathews who married Isaac Edward Mathews. I am the great great great granddaughter to William Mathis son of Captain Thomas Mathews and Ellen McKnight. I am Isaac Edward Mathews who is father is and who his mother is. I read that Isaac and Mary are distant cousins I need to figure out what relatives make them distant cousins. If you have links to the UK, in particular Llandaff, Cardiff, Wales please do get in touch as I am desperate for some positive energy and move forward! at the Long Cane SC massacre. Lots of interesting information out there about her. I am related to Mathes but it was changed from Mathews. I don’t know why the change. I am more interested in any information. Yes I found that puzzling to when I embarked on researching my paternal line of MATTHEWS. However do not be put off as I have found that within the same Matthews line the spellings change sometimes from generation to generation but it is still the same family. So in my case I look at all derivation of my surname ; Mathews, Mathew, Matthews etc. Can be confusing but the devil is in the details. Hello! I am excited to find this site. I have not known anything of the Mathews line until now. My paternal grandmother (Mary Lee Mathews Osborne) was the daughter of Autus Mathews. He was the son of Lorenza Walton Mathews, the son of John Mathews, the son of Josiah. John, Lorenza, and Autus are all buried in Port Cemetery in Sentinel, OK.
Do you still have a Mathews family reunion? I am looking for info on Jeremiah Matthews/Mathews (My 4th great-grandfather) b. ca 1784 Virginia ? d. ca 1830 Anderson County, Kentucky. Married Catherine Mizner 12 Nov. 1804 Mercer County, Kentucky. Child: Elizabeth “Eliza” Matthews b. 1807 Mercer County, Kentucky, d. 24 July, 1853, Anderson County, Kentucky. m. 16 Dec. 1834 Anderson County, Kentucky, Randall Walker b. 10 Aug. 1796 Anderson County, Kentucky, d. 11 Jan. 1863 Anderson County, Kentucky. Hi! I’m the granddaughter of Marvin Lonnie Mathews, son of Joseph, son of Simeon, son of Reece, son of Abraham (1786), son of James (1755), son of Moses – I think. I have Moses as a Mathis, married to Sarah Finley. I’m not sure if we cross over with your branch, but would love to find out! Thank you for your response, information and I shall bear you in mind. I have just started looking into my MATTHEWS lineage whose origins are from Llandaff, Cardiff, Wales, UK. So with that in mind I am minded to seek out those American families with the same roots. I thought I would reach out anyway. BTW. I love what you guys have done here and wish you all the best whether we are related or not. Please let me know if any information I may have is useful to your group. Thanks. I am looking for information on Richard Mathews (1803-Aft 1880), my 3rd great grandfather, 1840 living in Marion, Marion SC. Married Dorcus Poston. Migrated 1840’s Gadsden County Fl. Children Mary Elizabeth, Telitha, Rosanna, Solomon, Celia born in SC and Dorcus born in Gadsden County Fl. Thank you for your interest and response. My MATTHEWS lineage comes from Llandaff, Cardiff, Wales, UK so I am minded to concentrate on those American families that share the same origin. I am Andrew Arthur Matthews of Cambridge UK currently researching my paternal family line. There is evidence but as yet nothing definitive that I am blood related to the Earls of Llandaff. Cardiff, Wales, UK and if so my line goes back to medieval and even further. To date I have not found a link to the USA in particular , Jamestown Virginia where I known Samuel Mathew/s arrived from UK in 1622. Police Service, and various Indian Railway Companies. Thank you for your interest and response and what a wonderful tree you have. Yes I have come across John Matthews from Dorset , not Somerset, maybe a different person ? However I have not been able to evidence a link to my line. As my lineage originated in Llandaff. Cardiff, Wales, UK am minded to concentrate on any American families that share this location.